This Sausage Apple Cheddar Frittata is easy to make, low carb, super filling and so full of flavor – it’s my new go-to breakfast! I get bored with eggs sometimes but this egg dish is anything but boring. The homemade turkey sausage is full of seasoning and flavor and pairs perfectly with the sweet apple and sharp cheddar cheese. This frittata reheats well so you can make it once and eat it for breakfast for a few days or serve the whole family for breakfast or brunch. I was already torn between my love for my Corn and Zucchini Summer Frittata and Butternut Squash Autumn Frittata, but I think I might love this Sausage Apple Cheddar Frittata even more. A hearty, satisfying serving is just 189 calories or 2 Weight Watchers SmartPoints – a perfect way to start the day! Looking for more tasty, lightened up breakfast recipes? Check out my Strawberry Avocado Toast Flats, Berry French Toast Muffins, Bacon Egg and Cheese Breakfast Pastries, Raspberry Peach Baked Oatmeal Singles, Ham and Cheese Egg Cups, Orange Cranberry Baked Oatmeal Singles, Apple Cinnamon Slow Cooker Oatmeal, Apple Streusel French Toast Muffins, Ham and Cheese Hash Brown Quiche, Maple Bacon Breakfast Wraps, Pear Gingerbread Baked Oatmeal Singles, Bubble Up Breakfast Casserole, Strawberry Banana Baked Oatmeal Singles, Hummus and Feta Omelet, Mini Dutch Baby Pancakes, Sausage Egg and Cheese Hash Brown Cups and many more in the breakfast category of my recipe index! In a mixing bowl, combine the ground turkey with ½ teaspoon salt, ¼ teaspoon black pepper and the sage, thyme, marjoram and crushed red pepper. Stir (or mush with your hands or a fork) until the turkey is well combined with the seasonings. Mist an 8”-10” oven-safe nonstick walled skillet with cooking spray and bring to medium heat. Add the seasoned turkey and cook, breaking up with a wooden spoon, until the turkey is cooked through and broken into bite-sized pieces. Add the chopped apples and cook for 2-3 more minutes, stirring a few times. While the turkey is cooking, break the eggs into a large mixing bowl and whisk together until just combined. Add the yogurt, the remaining ¼ teaspoon of salt, ¼ teaspoon of pepper and shredded cheddar and stir together until mixed. When the turkey and apples are cooked, transfer them into the bowl containing the egg mixture and stir together. Spray the skillet you used liberally with cooking spray and then pour the egg mixture into the skillet. Cook on a burner set to medium heat for 5-7 minutes until the very outside edge of the frittata starts to turn opaque/look cooked. Transfer the skillet into the oven and cook for 15-17 minutes until the center is set. Let cool for 5 minutes, then slice into 6 slices and serve. Can’t wait to try this one out. Put the ingredients on my shopping list. Sounds delicious! 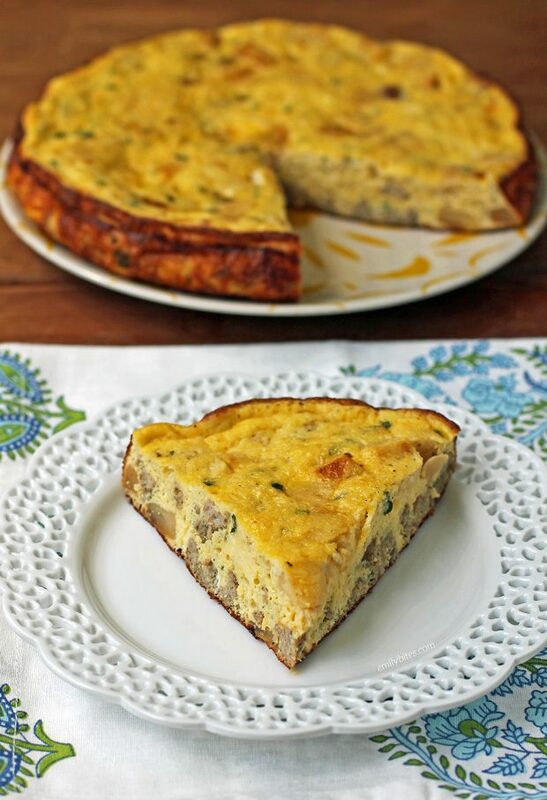 I absolutely love your autumn frittata and your corn and zucchini frittata, can’t wait to try this one! What kind of apples did you use? I’ve used a few different kinds, I think last time was an Empire? I hope you love this one too! I have loved the other frittatas, I think the corn zuchinni may still be my favorite just because of the freshness when the corn is in season…but this one was amazing as well! Yesterday my myfitnesspal had your recipes for breakfast, lunch and dinner lol. We love your site, thank you for coming up with such great and low cal recipes!! This is a super easy, tasty, filling and Point savvy recipe. I ended up using premade low-fat turkey sausage and swapped all but 2 of the eggs for eggbeaters. I also sautéed part of an onion and a bit of fennel bulb that I had from the night before. This is perfect for breakfast on the go, or served with salad for brunch with the girls. Love it!! Way better than quiche. Fantastic recipe. This was a great way for me to use the remaining 1/2 lb of turkey I had leftover from when I made the Thai Turkey with Carrot Noodles. I don’t have a skillet that can be used in the oven, if I were to cook up the turkey mixture and add it to the egg mixture and then bake in a casserole dish in the oven, how long do you think I would need to cook it for? Maybe 20 or so? For inquiring minds I baked in an 8×8 casserole dish at 350 for 25 minutes. It was still liquidy in the middle so I bumped it up to 375 for another 12 minutes and it’s perfecto. I really need to invest in a skillet though. Sooo tasty, it’s a keeper for sure. Thanks Elle! I just got back from vacation and I’m trying to catch up on comments. I’m glad you tried it because I wouldn’t have known what to tell you either since I’ve always made frittatas in an oven-safe skillet! I appreciate you reporting back for others! This is so great. Ready for a laugh? I was multi-tasking when I made the recipe and left out the best ingredients – the greek yogurt and the cheese! It still turned out really tasty and only 3 points that way. Can’t wait to make it the right way. Thank you for the great recipes, Emily. Was a little bummed I wouldn’t be able to make this (don’t currently have a cool oven skillet) but Elle’s comment has saved the day! Definitely going to make this sometime – maybe over the weekend to prep for breakfasts next week! I hope you love it! You may also want to check with the manufacturer. My nonstick cookware is oven-safe to 400 degrees so you may be surprised! Thank you for this recipe! I made this for dinner last night, and I have to tell you, it was AWESOME (I also may have eaten some for breakfast this morning…) I added some onion in with the apples, and 1/3 cup cottage cheese with the eggs, and I used Sharp Lite Celtic Cheddar cheese from Trader Joe’s, which reduced the smart points to 5. Really yummy and filling, adding a salad makes a perfect meal! The best frittata I have EVER had. I meal prepped it for the week and actually look forward to my breakfast every morning. So good! Can this be made ahead of time and reheated? Or prepped but not cooked until the next morning? Hoping to save some time in the morning! I made it for a breakfast and personally I think it needed more seasoning. It was pretty bland. More salt for sure. However it is a good recipe and easy to make. I will just spice it up a little! Would a cast iron skillet work for making this? Very tasty! My wife and I both enjoyed it. The spices for the sausage were spot on for my tastes. It was also an easy meal to put together. Thank you for sharing a very good recipe!